As a football fan, I always watch with interest to see what the tournament’s official sponsors have done to get the most of the World Cup as an asset, particularly to see whether they have created effective local engagement alongside global consistency in the customer experience – and, of course, commercial efficiency. The starting point is developing a business and brand strategy that works at both local and global levels by basing the brand and its products on human needs, desires or truths. Here’s how four of the pre-tournament favourites have fared this summer. Coca-Cola have been doing some interesting things on a local level that, curiously, might actually play better than its global approach. The "Together"ad does a fine job of connecting with Icelandic football fans by embracing the country's recent football success with their famous Thunder-Clap, some shots that the Icelandic Tourism Board would be proud of and even an appearance from the (Icelandic) World's Strongest Man. You don't have to be Icelandic to understand or love it, however. I am talking about the team that endeared themselves to a generation of football fans in their run to the quarter finals at Euro 2016 – even despite beating England along the way. Football is incredibly connective on a global scale anyway, but this Iceland team doubles down on that. Coca-Cola have gleefully tapped into an open net here. But you then have to look at how Coca-Cola have managed the balance between its football property – Iceland, in this case – the audience and the brand. Do you have a healthy connection between the three. On that score, Coca-Cola have almost blunted Iceland’s rugged persona and made them quite vanilla in order to sit with Coca-Cola. It’s the equivalent of playing Frank Lampard alongside Steven Gerrard in England’s midfield – one had to compromise their game. The tone is far more happy-clappy than you feel it should be for Iceland. I can only imagine what an Icelander’s reaction would be. The product and ritual part of it is so heavy-handed that it never strays too far from their tried and tested "Eat Football, Sleep Football, Drink Coca-Cola" line. To a large extent, every football-themed ad they have put out since then (1996) has been a not-too-subtle variation on that. If you’re a football fan it will send shivers down your spine – if you are prepared to accept the Coca-Cola stamp alongside the Thunder-Clap. Result: Full of talent and possibility, and a safe pair of hands will get Coke through to the quarters. The ad was directed by Hannes Thor Halldorsson, who leads a fascinating dual existence as a TV director and Iceland’s goalkeeper, after all. With its player ambassadors, Adidas has something of a golden generation of stars to choose from. And the sports brand has really done them justice for this tournament, using player interviews and archive film to create five-minute social films with high production values that – quite brilliantly – tick the global and local boxes. Take England's Dele Alli. His short film is titled "Destined: From Milton Keynes to Moscow" and charts how Alli's creativity was "crafted on the courts of Milton Keynes" using his family, academy coaches and the player himself talking about how playing on the streets, in parks – the same as hundreds of thousands of kids do – has led to this moment: playing in the World Cup. The care and attention Adidas has taken with this shows it understands it is not enough just to badge up a player or team with your brand. Adidas has got under the skin of the kind of things football fans talk about – the minutiae, showing fans things they might not have known about globally renowned players. Adidas has done the same with Luis Suarez: "Strength and creativity formed on the streets of Salto [Uruguay]." It's in Spanish, with subtitles for a UK audience – so it remains relevant to the UK market. Both Alli and Suarez are world stars; Suarez was also enormously successful when playing in the Premier League and has huge global appeal at Barca. But Adidas has taken each of their stories back to the very beginning, where they first started playing in streets, parks and playgrounds. All football fans can relate to that on a local level, wherever they come from, because whether it is Milton Keynes or Montevideo, millions of football fans have started out with similar aspirations. Result: Adidas has struck a beautiful balance of being both slick and sensitive, and that enables local customers to feel as if they ‘own’ their brand, no matter how multinational and stormed through to the final. "A World Cup without me is not worth watching," says Visa ambassador and former Sweden star Zlatan Ibrahimovic. "But a lion cannot miss the hunt." 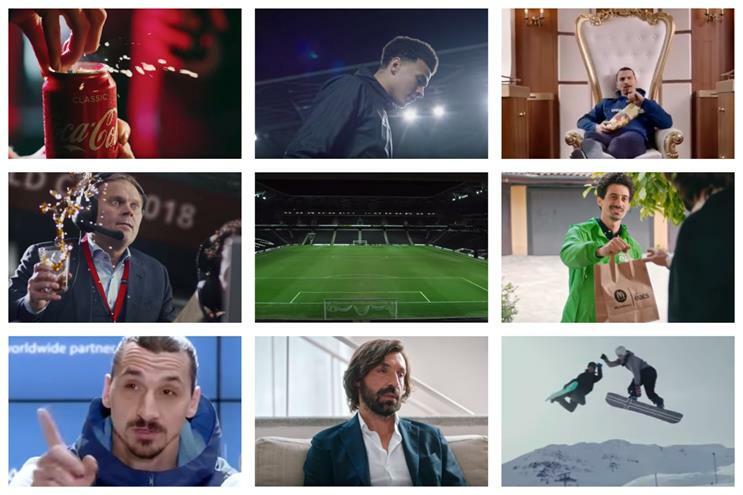 Fair enough, Zlatan is a huge personality, and Visa has looked to pin its strategy on parodying his infamously self-assured persona. But I wouldn’t even put Visa on the plane to Russia with this, The ad encapsulates everything that gives football marketing a bad name. It’s the Scotland of this World Cup. And I can say that, because I’m Scottish. Zlatan gives a banal, stilted performance in a Visa-branded sweatshirt and it is beyond painful. It’s also a surprising match for the brand, choosing a player who is quite divisive. England manager Gareth Southgate – smart, sensible and at least going to the World Cup – is perhaps a better brand match. Result: For its global consistency to be effective, you have to be on board with Zlatan’s ego. No one wants to miss the World Cup, but with zero local engagement and the briefest of nods to the ‘customer experience’, I think we can all wish Visa better luck in qualifying for the 2022 tournament. McDonald's is a long-time World Cup sponsor, and has gone heavy with its Russia 2018-branded marketing in, for example, the US. But over here McDonald’s is still pushing "The Great Taste of America" less than a week before the tournament begins. Is this a sign that marketing around the WC – both local and global – is far more difficult than ever it has been? In some countries, perhaps. Add together Putin, Salisbury poisonings, (alleged) meddling in the US election, a police state and a poor record on racism and homophobia and these are not exactly perfect conditions to think local-out. In other words, taking Russia as your starting point for your campaign and running with it from there. The Golden Arches’ most notable foray into the Russian penalty box is its McDelivery tie-up with Uber Eats and former Italy star Andrea Pirlo. Like Pirlo, they have decided to stay at home with their marketing. Italy, you see, failed to qualify, and therefore is asked to choose which team he will be supporting while enjoying the World Cup at home on television. Pirlo’s performance is the antithesis of Zlatan’s Visa venture. He plays it straight – like any player or fan, he’s deeply disappointed to miss the World Cup – and the ad is all the richer for it. There is a basic human truth in that. Result: It might not be subtle, but Uber Eats and Maccy Ds strike a good local/global balance with a seemingly reluctant star turn. The tournament’s marketing dark horse is a good bet for a run to the semi finals.